For pups who seem to chew up everything in sight, there's a better alternative to icky gym shoes and TV remotes. 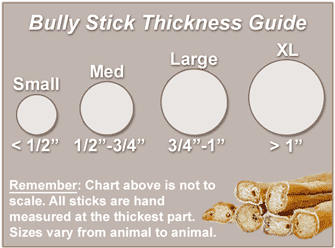 Available in an XL thickness that's perfect for aggressive chewers, our 9" Straight Bully Sticks are delicious and nutritious dog chews that are guaranteed to keep your pup happy and busy for hours on end. Made of real, all-natural beef pizzle, these long lasting dog chews are free of any artificial ingredients, making these some of the best bully sticks you'll ever find online.